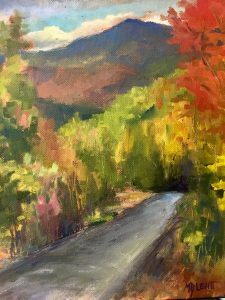 In this 3 week painting workshop, beginner students will learn how to paint a Fall scene of their choice in either oils or acrylics. We will begin with a color mixing lesson and then focus on creating a dynamic composition. Students will learn about creating notan sketches and how to work quickly to create multiple painting studies before starting the final painting. Photos will be provided as a reference or students can bring their own. The instructor will lead the class with demonstrations and a lessons each week. Students will gain an understanding of how to depth and light in their painting. This class is suitable for the beginner student who wants to further their skills or the intermediate student who wants to get to the next level. A supply list will be emailed to registered students. Oils or acrylics are suitable for the class but the instructor will be demonstrating in oils. (Jackson Art can provide students with use of art materials for a fee of $85 for the three nights: includes use of oil paints, brushes, palette, rags, gamasol, canvas, & drawing supplies) Also open to high school students. Cancellation Policy. We ask that you to give us one week notice if you need to cancel for a full refund minus a $15 cancellation fee. Cancellations should be made by phone by calling (603) 387-3463. This provides us the opportunity to fill the space. We are sorry, but we cannot give refunds or issue credits for ‘no shows’.